6-year-old Caden Buth has received treatment at UF Health Shands Children’s Hospital since he was an infant. At 4 weeks old, Caden was diagnosed with severe hemophilia A, a bleeding disorder where the body does not make enough protein in the blood, called clotting factors, to create a clot and stop bleeding. If left untreated, hemophilia can cause severe joint damage and life-threatening bleeds. “Caden has never known a life without hemophilia or Shands. Shands is as normal to his life as daycare,” said his mother, Christina. Living with a rare condition has presented many challenges for Caden and his family. In 2015, the port where Caden received his factor injections became infected and landed Caden in the hospital for six weeks. During this time, the Buth family had to uproot their lives from Tallahassee, Fla., to be with Caden at UF Health Shands Children’s Hospital in Gainesville. His doctors eventually decided to remove his port and place a broviac catheter, a soft, flexible tube that is tunneled under the skin of the chest and inserted into a large vein near the heart. Caden’s treatment regimen changed again in April 2017 when doctors started immunosuppression to decrease his inhibitor. While this worked for a few months, the results did not last. In November 2017, the FDA’s approval of a new weekly subcutaneous hemophilia therapy brought about another change to Caden. He began this treatment in early 2018 and continues receiving weekly injections. He has had no bleeds since starting the new treatment and was even able to have his port removed in July 2018 — just before starting kindergarten in the fall. Caden is a positive and energetic child who spreads joy to all he meets. He likes to spend his free time drawing and playing dinosaurs. Caden loves participating in Dance Marathon and is often found hanging out with his “DM besties.” At Dance Marathon at Florida State University in 2018, you could find Caden dancing his way around the Civic Center at FSU, joining the morale captains in welcoming dancers to the event. 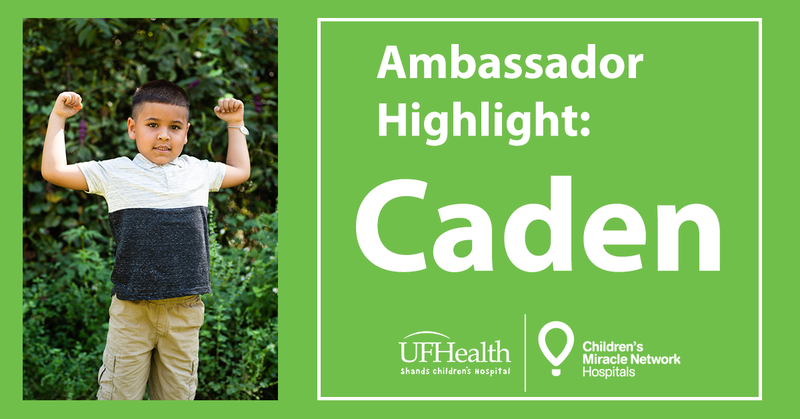 Caden is a great big brother to his sister, Cailani, and likes to remind his family that they are “always a team.” When Caden grows up, he wants to be a police officer or a DJ. Until then, Caden has a new job. UF Health Shands Children’s Hospital is delighted to announce that Caden will be serving as the 2019 Local Champion. He and his family are excited to have the opportunity to spread awareness about his rare condition and the care provided to local children and their families at UF Health Shands Children’s Hospital. Interested in learning more about our CMN Ambassador Program? Visit giving.UFHealth.org/ambassadors.